This entry was posted in Gardening, Home Improvement, Vegetables. Bookmark the permalink. Nearly everyone agrees that there is nothing tastier than a homegrown tomato. Even if you don’t have a vegetable garden or a green thumb, you can grow tomatoes. There are a few things to contemplate before choosing what kind of tomato you want to grow. 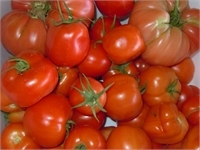 There are two basic types of tomatoes – determinate or indeterminate. The determinate kind will grow to a certain height, set most of its fruit all at once and give you one main harvest. Determinate types do not typically get very tall. Or you can choose to grow indeterminate plants which will continue to grow and set fruit until a frost kills the plant. There so many varieties to choose from that it can become a little daunting. So let’s break it down a little. What is your preference? Do you like small cherry tomatoes which are perfect for eating as a snack or in a salad? Cherry, grape or small pear tomatoes are usually prolific and take more time to pick. How about a general purpose tomato that is neither too large nor too small? Early Girl is a good general purpose and has the added advantage of ripening sooner than other varieties. Big Boy or Better Boy are also general purpose but being larger take a little longer to produce ripe fruit. You may be hankering after a large beefsteak tomato to put on sandwiches or hamburgers. Beefsteaks tend to take the longest to ripen due to their size and don’t produce as many tomatoes. Another popular choice are Heirloom or Open Pollinated tomatoes which come in all colors from pink to dark purple, yellow to green and even striped. If you are purchasing your tomatoes from a local retailer your choices will be limited to what they have on hand. This may be a good thing as usually the plants offered will do well in your area. For the more adventuresome, you can purchase seed from an online company or your local home improvement or garden center. Tomatoes prefer warm weather and soil. Many people plant their tomatoes very early and cover them with a cloch to prevent freezing. However, these plants will often sit in the soil without growing until the soil warms anyway. Tomatoes require a minimum of 6 hours of direct sunlight per day. Study your yard and determine where the sun shines for the longest period of time. This is the ideal location for your vegetables. If you don’t have anywhere that supplies this prerequisite, consider growing your tomatoes in pots on a sunny patio. If you do choose this option, chose a variety developed specifically for container gardening. A tomato will grow in almost any soil, but you want to grow the best tasting tomatoes ever. A little preparation will go a long way to ensure the desired results. Dig the soil up at least one to two feet deep. Remove any grass or weeds so they are not competing for nutrients. Work in some compost, well rotted manure and several tablespoons of bone meal to the soil. You may also purchase a pH test to determine if your soil needs further amendments. Follow the recommendations made on the package according to the test results. Finally it’s time to plant. Take your tomato plant in hand and cut off the bottom two-thirds of the leaves. Yes, you read that correctly. Remove the container from around the root ball and fluff the outer roots or trim the tips from the roots. Now bury the tomato plant all the way up to the leaves left on the plant. Tomatoes are one of the few plants that will grow new roots all along the stem. By creating more roots, you will grow a sturdier plant. Water the plant to eliminate any air pockets around the roots. Tomatoes require 1 to 1 1/2 inches of water per week so dig a trench around your plants to water. Water in the morning and do not water with an overhead sprinkler to avoid fungal diseases. Also maintaining constant moisture rather than allowing the soil to be too dry or soggy will prevent such problems as Blossom End Rot. The last thing to consider is support. You can let your tomatoes sprawl on the ground, but they will take up more space and be more difficult to harvest. You are likely to break the vines as you root around for ripe fruit. Tomatoes lying on the ground are more likely to rot and be eaten by bugs. Tomato cages are usually sold at the same store where you bought your plants; however, they may be insufficient for your needs if your plants get taller than a few feet. Consider using heavy gauge fencing materials staked to the ground or building a teepee out of wooden stakes. Tie the vines to the support as the plant grows. Keep in mind that mature plants can get over six feet tall and will be top heavy as the fruit sets on the vine. Now comes the hardest part. Waiting. But the wait will be worth it when you pick your first ripe, juicy tomato and take a bite. What are the most nutritious fruits and vegetables you can grown in your backyard?